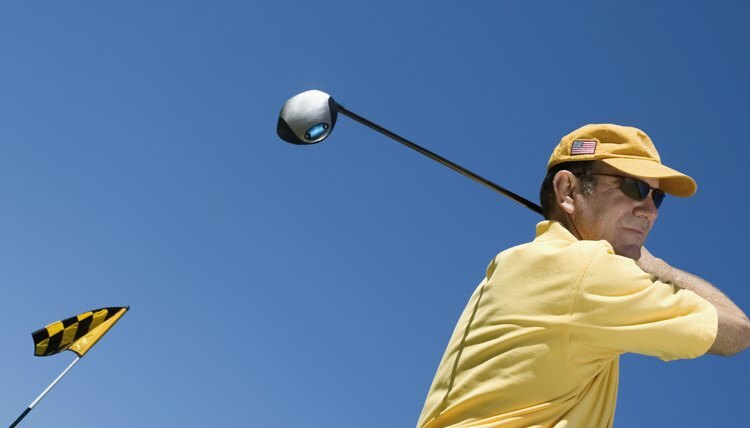 A golfer may carry up to 14 clubs in his golf bag under the official Rules of Golf. There's no rule he has to carry that many, though, and within the 14-club limit there are many variations in the types of clubs he can carry. Some golfers prefer to carry three or more wedges, for example, to deal with different situations around the greens that require shots of varying trajectories. Most golfers carry several woods -- although they're actually made of metal -- and the rest of the 14 are irons plus a putter. As a golfer becomes more skilled, he learns how to use these clubs to improve his accuracy, play more strategically, get down in two more often from off the green, and lower his scores. Most golfers are more accurate with their irons than with their woods. And short irons -- those from the 7-iron on down -- are easier to use than long irons. On a par-4 with an extremely narrow fairway or trouble such as water on one side, a golfer may elect to tee off with an iron to be more certain she can hit the ball in the fairway. She sacrifices some distance to maximize accuracy. Even Jack Nicklaus employs this strategy -- he calls it playing the club that keeps him short of trouble. Many amateur golfers think they can hit the ball farther than they actually do, so they leave the ball short of the intended target. The instruction book "Private Lessons" points out that on many holes, particularly par-3s, the hazards such as bunkers are between the tee and the green. Learn how far you hit each club in the bag on average -- not with your very best shot -- and select the club that can put the ball on the middle of the green with this average strike. Your instinct may tell you the right club is a 3-iron, when the reality is a 5-wood might be a better choice. With the wood, you can make a smoother swing and still hit the ball the correct distance. When confronted with a lengthy shot to the green out of the rough, a common mistake is to try to hit the iron that matches the distance to the green instead of considering the effect of the ball laying deep in the grass. The correct play could be to hit an 8-iron with the objective of just getting the ball safely out of the rough and onto the fairway. By taking a 5-iron, as called for by the distance, the golfer runs the risk of getting the club tangled in the rough and not making solid contact with the ball. Golfers tend to have more confidence with some clubs than with others. Shots with long irons intimidate some golfers, and they may be better off hitting a wood instead -- clubs that make them feel more secure when they address the ball. In recent years hybrid clubs -- those that blend key characteristics of woods and irons -- have become popular choices, replacing long irons in a player's bag. The hybrids provide the distance the golfer needs, along with accuracy similar to irons -- but allow him to play with the same confidence he does with his woods. Golf clubs can be employed creatively in situations that may seem quite different from their intended uses. A fairway wood or a hybrid club can be an effective tool to chip the ball from the fringe instead of the iron you might normally use, allowing you to take a lower, smoother swing and have better contact with the ball.